Michael Skelly, Senior Advisor, Global Power, Energy & Infrastructure, Lazard Freres & Co. LLC will be speaking on panel discussion: Delivering on the 2020 Push. Lazard Ltd recently released its annual in-depth studies comparing the costs of energy from various generation technologies and of energy storage technologies for different applications. Lazard’s latest annual Levelized Cost of Energy Analysis (LCOE 12.0) shows that, in some scenarios outlined below, alternative energy costs have decreased to the point that they are now at or below the marginal cost of conventional generation. 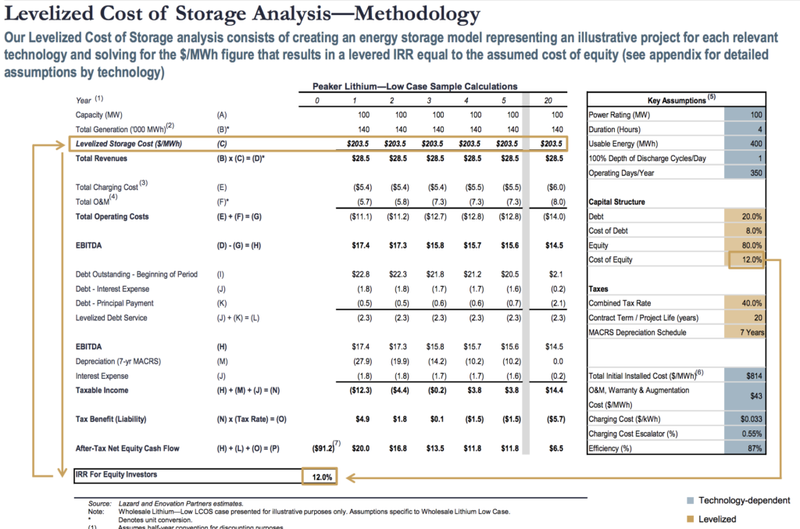 Lazard’s latest annual Levelized Cost of Storage Analysis (LCOS 4.0) shows significant cost declines across most use cases and technologies, especially for shorter duration applications. – While alternative energy is increasingly cost-competitive and storage technology holds great promise, alternative energy systems alone will not be capable of meeting the baseload generation needs of a developed economy for the foreseeable future. Therefore, the optimal solution for many regions of the world is to use complementary conventional and alternative energy resources in a diversified generation fleet. – The cost of generating energy from utility-scale solar photovoltaic (PV) and onshore wind technologies continue to decline. The mean levelized cost of energy of utility-scale PV technologies is down approximately 13% from last year and the mean levelized cost of energy of onshore wind has declined almost 7%. – The levelized cost of energy of gas technologies saw a modest decline year-over-year. The mean levelized cost of energy of gas peaking fell 2% and the mean levelized cost of energy of combined cycle gas has declined 4%. – The low end levelized cost of onshore wind-generated energy is $29/MWh, compared to an average illustrative marginal cost of $36/MWh for coal. The levelized cost of utility-scale solar is nearly identical to the illustrative marginal cost of coal, at $36/MWh. 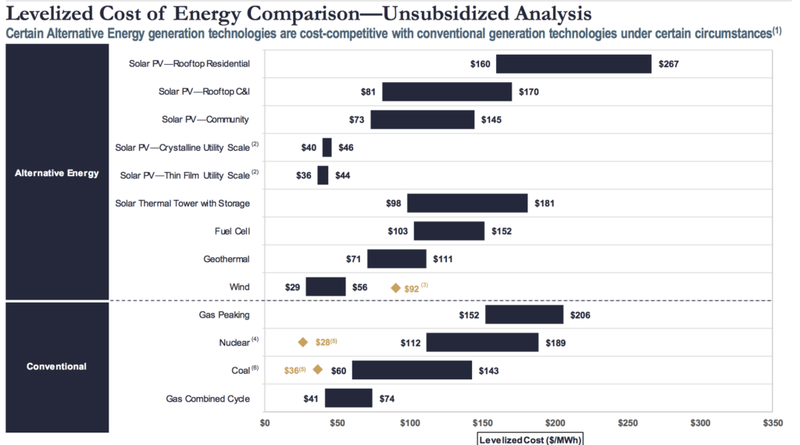 This comparison is accentuated when subsidizing onshore wind and solar, which results in levelized costs of energy of $14/MWh and $32/MWh, respectively. – Lithium-ion remains the least expensive of the storage technologies and continues to decrease in cost due to improved efficiencies and a maturing supply chain. However, some of those gains may be mitigated by rising cost pressures from higher commodity pricing (e.g., cobalt and lithium carbonate) and tightening supply. – Project economics for a variety of illustrative energy storage applications have modestly improved year-over-year, reflecting improved costs rather than rising revenues, which remain dependent on local market dynamics or utility tariffs. Ancillary service products (e.g., frequency regulation), demand response and demand charge mitigation represent potentially attractive revenue opportunities. – Combining energy storage with solar PV can create value by sharing infrastructure (e.g., inverters, interconnection), reducing curtailed production, capturing “clipped” solar production and/or through charging cost savings. Currently, the economics for solar PV + storage systems are most attractive for commercial use cases, but remain modest for residential and utility-scale projects. – Industry participants expect costs to continue to decline over the next five years, driven by economies of-scale, improved standardization, technological improvements and increased renewables penetration. Technology-specific cost decline projections vary widely, but are expected to be as much as 28% for lithium-ion technologies over the next five years.